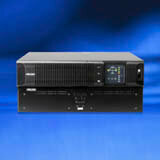 The SSG-RP UPS is agency-certified (UL, cUL, CE) to operate reliably in ultra-wide temperature environments. All 120V models are also UL 508 listed. Tested and designed with robust components and materials, the SSG-RP assures reliable operation and a long service life in very demanding temperature environments. It is a true on-line industrial UPS. Falcon Electric is a recognized authority in industrial UPS solutions. Our technical expertise assures you find the right solution – the first time.